The current flag of Maine is the second design to represent the state. 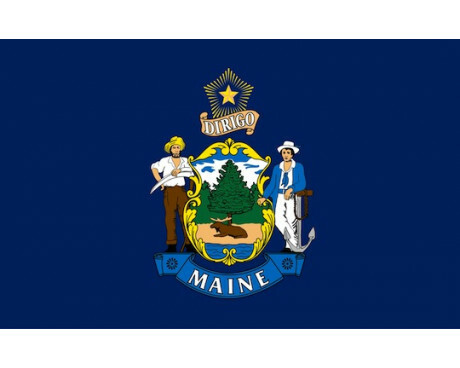 Maine did not use a state flag for the vast majority of its history, so the current Maine state flag has only been in use for slightly more than one hundred years. The state of Maine flag has an unusually variable design. It has a solid blue field which is always the same shade of blue as that of the national flag, but the rest of the flag's colors can vary between one flag and the next. The center of the flag is dedicated to the state's coat of arms, and that coat of arms does not specify the precise colors that should be used. The coat of arms is made up of a farmer and a sailor who support a shield that displays a moose resting under a pine tree. The farmer and sailor represent the primary professions of Maine's early settlers, while the moose and pine tree reflect its wildlife. A star is placed above the coat of arms, which is meant to represent the state's motto. 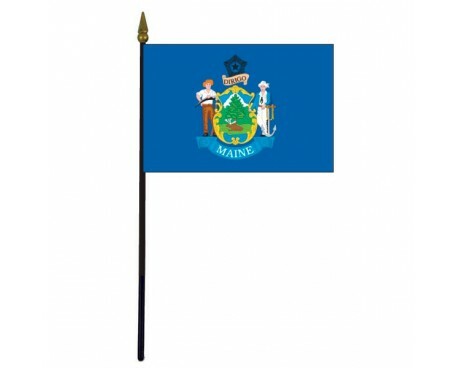 The government of Maine specified that the state of Maine flag should have a fringe made of yellow silk and be displayed with a cord of blue and white silk attached to the end of the pole. Very few flags are displayed in that condition, but those that are flown at the most formal occasions usually adhere to the guidelines. 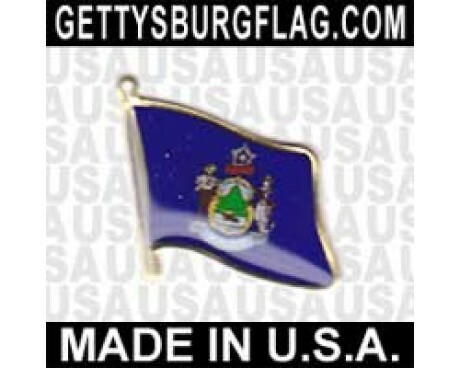 The first Maine state flag was adopted in 1901, but it was not used for very long before it was replaced. 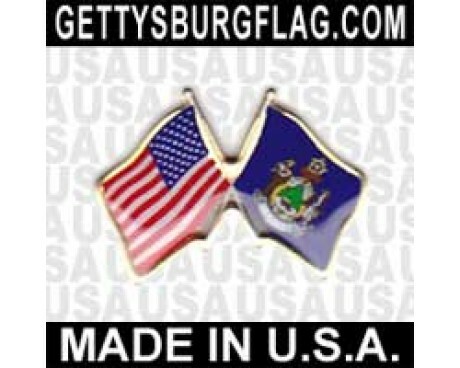 The original flag consisted of a green pine tree next to a blue star on a buff field. The pine tree was a symbol of New England, while the star was a symbol of the state's place in the northern reaches of the country. The design was unpopular and did not have a large influence on later designs, although the pine tree does survive in both the state's coat of arms and the state's naval ensign. 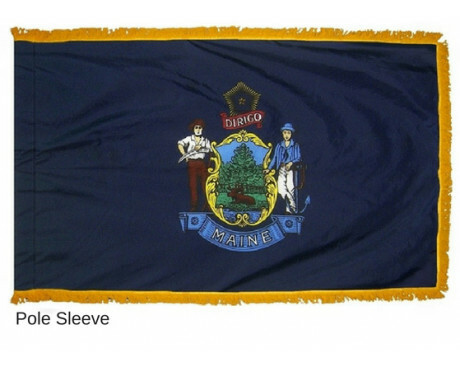 The 1901 flag of Maine was officially replaced in 1909, and the design has not been changed since that time. One of the main industries of Maine is forestry, which produces paper and wood pulp. Wood was used mainly for shipbuilding in earlier times. The white pine of Maine is the chief feature of the state seal of 1820. Indigenous to the state is the moose, which is located at the foot of the pine tree. A farmer and a sailor are the supporters of the shield containing these emblems. They also remind us that Maine is both a maritime and an agricultural state. A glowing North Star, indicating that Maine was then the northernmost state of the Union. The usual practice during the Civil War was that arms are used on blue field. 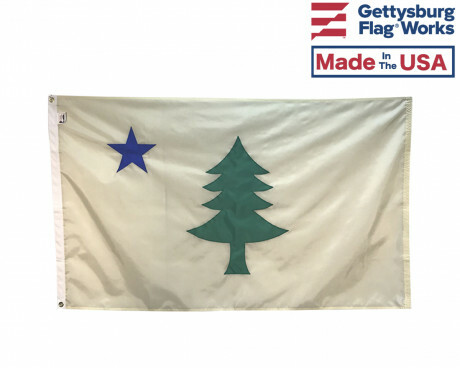 In March 1901 the second flag was adopted, and this time showing the pine tree in the center of the buff-colored background, and with the North Star in blue within the canton. Although this flag is still legal it is rarely seen. On February 24, 1909 the Civil War flag was adopted, and is used with the military fringe, cord and tassel. In July 1939, a third flag was adopted, a "merchant and marine" version which is only used for use at sea. Maine is located in the extreme north-east of the U.S. surrounded on three sides by Canadian territory. Maine belonged to Massachusetts from 1652 to 1820. On March 15, 1820 it became a state of its own. Major Products: potatoes, dairy products, eggs and poultry, timber and wood products, fish and seafood, paper.